Super Bowl Sunday is over and done with, but I still have a recipe for a casual and easy party dessert to share with you. After all, you don’t need football to enjoy peanut butter and chocolate, do you? In spite of the fact that I really don’t care much about sports, I admit that I’ve always been a little envious of others who were so much better at sports than I was, who simply looked more graceful, more coordinated, more confident. Riding my bike, roller skating back and forth on the cement patio behind our house, hiking in the mountains now and then and splashing around in the pool was about as athletic as I got. And occasionally hitting a softball in the front yard with my dad, although I found it frustrating that no matter how well I was able to hit the ball when he tossed it, I couldn’t seem to hit it when anyone else was doing the pitching. In junior high, the P.E. classes for girls were basically a joke – a couple laps around the gym, a few minutes of crunches and useless leg-lift exercises, and then a half hour of playing at whatever was the assigned activity for that semester. The semester we had to do tumbling was a nightmare, as the teacher seemed to have no concept that someone who hadn’t been trained since childhood to do a leaping full-body flip off a balance beam into midair would not be able to suddenly do it at the age of 14 without crash-landing on her face. If only someone had thought to turn those useless classes into Yoga or Pilates sessions, and they would have done some good. As far as a sports program at my high school, there was nothing for the girls to participate in except for volleyball. Even the boys only had basketball, football and wrestling. So I drew and painted, sang in choir, played percussion in band, sewed, cooked, read, wrote, dreamed… and my already sluggish metabolism seemed to die into something practically non-existent, as I didn’t learn early on the importance of exercise, or how to find a physical activity that was interesting and enjoyable to me, and that I could excel at. Something I’m trying to rectify now, which of course, is much, much harder at 34 than 14. I need to find my exercise niche that will wake up my metabolism from its sleepy state. I started a new workout routine this week, and every muscle in my body hates me right now! My brother played basketball all through high school, and I’d shoot hoops with him now and then, but having to sit through a basketball game on TV was slightly torturous. I’ve never understood the appeal of watching sports, as it pretty much bores me out of my mind to watch a whole game of anything on TV. So I could have let Super Bowl Sunday come and go with hardly a glance, except that I have a boyfriend and friends who actually like football. And while I could care less about the reason for the day, I was looking forward to an afternoon visiting with friends, as well as the nacho/taco bar. 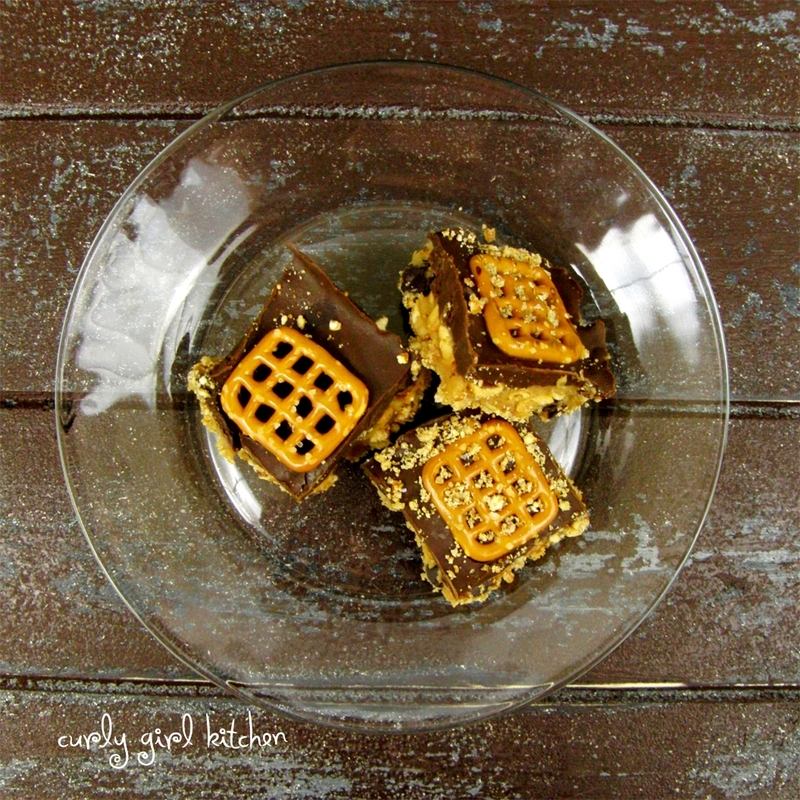 As I thought about a party dessert to share, I knew that something too fussy or pretty would just be out of place, so I immediately thought of chocolate, peanut butter and pretzels. Salty and sweet. Crunchy and creamy. That sounded perfect. This bar cookie is no-bake, except for the pretzel crust. Then you top the cooled crust with a creamy, lightly sweetened filling of whipped peanut butter, cream cheese and marshmallow cream that’s been folded together with crunchy, salted peanuts and chocolate chips. 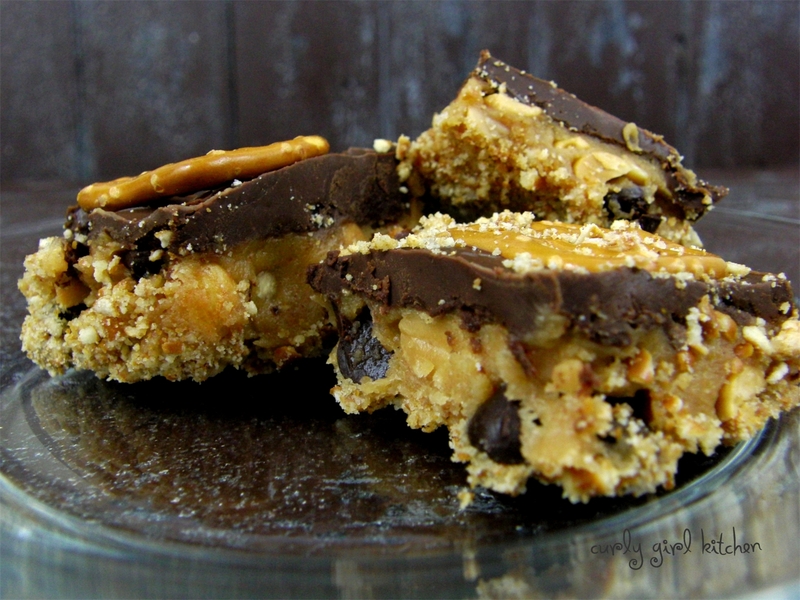 On top of the filling is a simple “ganache” made from melting peanut butter and chocolate chips together until smooth. 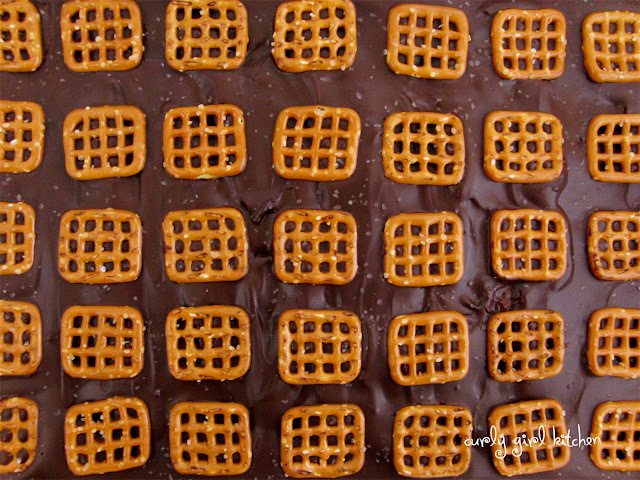 Lastly, rows and rows of pretzels and a sprinkling of Kosher salt to finish it off. After chilling thoroughly, the bars are ready to be cut and served. I made a big pan of these for the party, and only had 4 or 5 left to take home, which made me happy. The only downside is that they really are best cold, since the no-bake filling softens at room temperature, especially in a kitchen that’s overheated from 30 crock pots full of taco meat and queso. And since guests may not help themselves to something that’s in the fridge, rather than out on the counter with the rest of the food, you can keep these cool on the counter by placing the pan in a larger pan that’s filled with ice. This really was a perfect party dessert! Preheat the oven to 350. Line a 9x12 pan tightly with foil, leaving a 1-inch overhang at each end. Spray with non-stick spray. In a bowl, combine the crushed pretzels, flour and salt. Drizzle with the melted butter and toss with a fork to moisten. Press firmly into the bottom of the pan. Bake for 10 minutes, then set aside to cool completely. In the bowl of your stand mixer fitted with the paddle attachment, beat the peanut butter, marshmallow cream, cream cheese, vanilla and powdered sugar on low to combine, then on medium speed for 3-4 minutes until smooth and creamy. Stir in the peanuts and chocolate chips. Spread evenly over the cooled crust. In a heatproof bowl, combine the chocolate chips and peanut butter. Place the bowl over a saucepan of gently simmering water (the bottom of the bowl should not be touching the water). Stir occasionally with a spatula until the chocolate is melted and the mixture is smooth. Spread evenly over the filling. Arrange the pretzels on top of the chocolate topping and sprinkle with the Kosher salt. 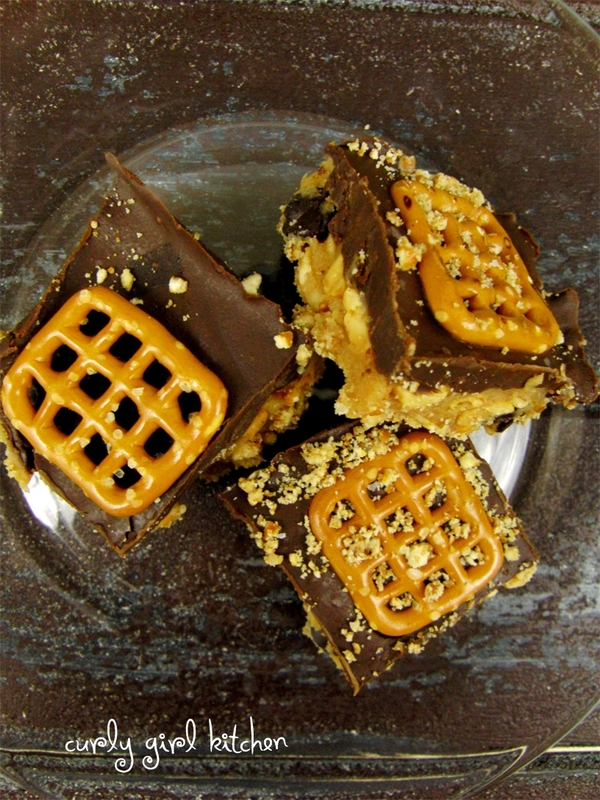 Refrigerate until firm, at least 3-4 hours, or overnight, before lifting the foil out of the pan and cutting into bars. Keep refrigerated until ready to serve.